So, you’ve been Bible Journaling for a while now. Your friends at work and church admire your Bible Journaling entries and say that they want to learn to Bible Journal, too. Then a little idea creeps into your head. I wonder if I could host a Bible Journaling workshop? At first, this can be a daunting idea. If you attend a small to mid-sized church, then you may be the only one expressing your devotional time with Bible Journaling. 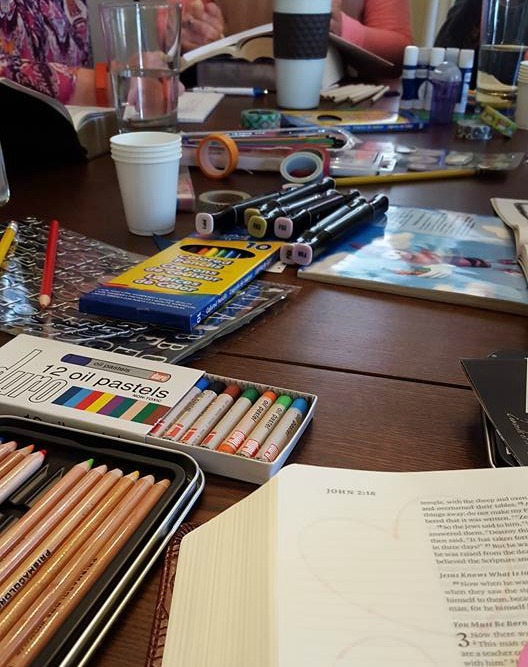 So how do you begin sharing your creative faith with those around you in a workshop setting? This happened to me and my friend Mary about a month ago. 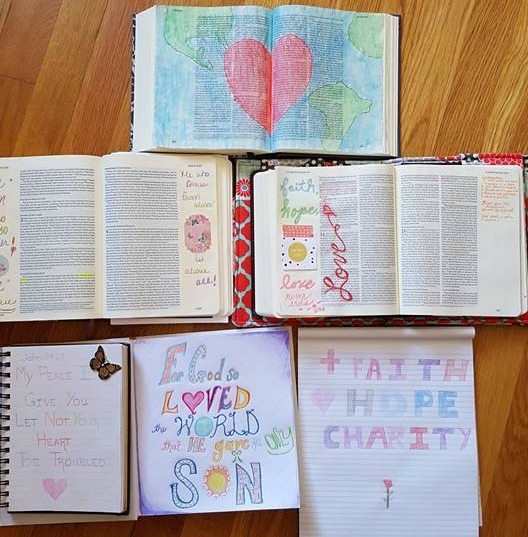 We had both been dabbling in Bible Journaling for a few months, and we had been sharing some of our entries on social media. 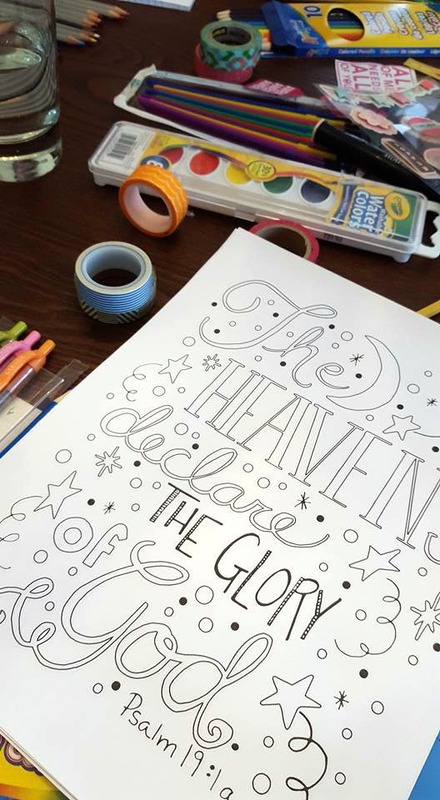 We tossed around the idea of hosting a Bible Journaling workshop until we made it a reality. This past Saturday, we hosted our first Bible Journaling workshop. It was a wonderful time with awesome ladies, and I found it to be a great experience. 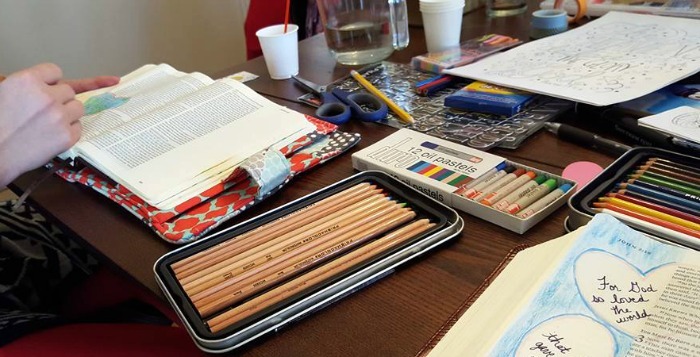 Are you thinking of hosting a Bible Journaling workshop? I’m sharing how we planned ours, plus a few tips to hopefully help you in your planning. Do you have a like-minded friend or Bible Journaler? Partner together to host a workshop. Even if your partner is looking to learn more about Bible Journaling herself, having a partner to assist in snacks, bringing supplies, or responding to RSVPs is priceless! Pulling a workshop off without a partner is not impossible, but any help always helps! Do you want to open the workshop up to the entire church? Or do you want to keep it to only those in your Sunday School class or small group? Or maybe you want to include friends from work or other churches? These are all things to consider when deciding on the number of guests. Everyone’s situation will differ. For those in a small church, inviting the entire church may be feasible. Consider the interest in Bible Journaling in those that you intend to invite. Of course, if you have had several people approach you and inquire about a Bible Journaling workshop, then you may already have your guest list. I will note that if you would like to have a specific number at your workshop (10, for example), make your guest list for a few more. There are always going to be life events that hinder those you’ve invited from coming to the event. For our workshop, we had 16 on the guest list and had a total of 6 who actually attended. The number of guests that you invite will determine the place. A smaller number means that you may be able to host it in a home or a small group classroom. Mary hosted at her house for our workshop. She lives close to our church, making it convenient yet homey and comfortable. If a large portion of your guest list is from your church, be sure to check the church calendar when doing this. Make sure that there are no large church events planned simultaneously that would hinder a majority of attendees from coming. We did a Facebook group invitation. It worked well. In our invitation, we asked attendees to bring a notebook or journaling Bible, colored pencils, a pen, and watercolors (optional). For our workshop, Mary purchased extra supplies from the dollar store in case someone forgot to bring a notebook or pencils. Most attendees will probably bring what is asked, but it is always helpful to have extras on hand just in case! Have at least a small selection of your own journaling entries to share with everyone. Bring some of the supplies that you use on a regular basis. One of the fun things about these workshops is being able to try supplies that you do not have. If you have items such as watercolor pencils, washi tape, or a special pen, bring it along for others to check out and try. Not everyone may be feeling artistic or feel comfortable journaling for the first time. Print out a few inspiration coloring pages, such as this one from Pitter and Glink, to take to the workshop for those who would like to color those. Have at least one familiar verse in mind for everyone to reference and journal initially. Mary and I each chose one for our workshop: John 3:16 and I Corinthians 13:13. Everyone felt comfortable with these verses and were able to journal them fairly easily. It was also nice to see everyone’s different creative interpretations of the verses. You do not have to be an artist to Bible Journal! The best journaling is not forced. It comes from meditating on God’s Word, which comes from reading God’s Word. It all goes hand in hand! You do not need fancy supplies for Bible Journaling. 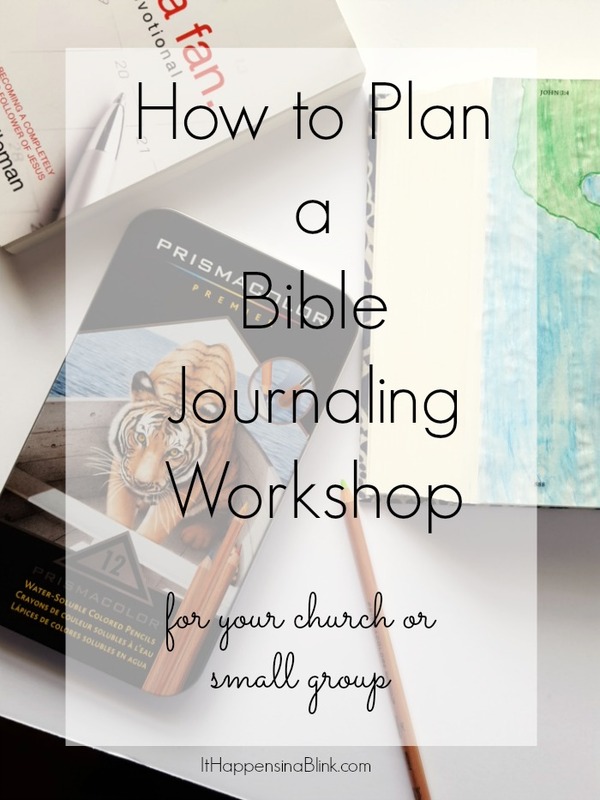 Have you hosted a Bible Journaling workshop? What tips would you add to the list? I really like the idea of engaging church members by having them do some reflecting on what The Word means to them. It seems that organizing everything is the hardest part nowadays, but thankfully social media services like Facebook have made things easier with their event pages. Once everything’s lined up and people know where to go and when to be there, it’s just a matter of getting the conversations started and picking out passages to reflect on. Thanks for sharing! I agree. My husband Jason is a youth minister, and he often mentions that planning an event is the hardest aspect of his ministry. Thanks for stopping by! A couple of ladies and I have started a missional community revolved around journaling. We meet in a different place along our towns Main Street. The idea is to develop relationships with people around you. We just need a name now. Any ideas? Oh, wow! That sounds like an awesome mission. Coming up with names for a group or any project is often the hardest part! I’ve changed my blog name 3 times and would change it again if it wasn’t so much trouble! Haha! So I’m definitely not very good at naming things. Perhaps you ladies could start by listing your goals or ideas and developing a name based on that. Or perhaps choose a word that you can serve as an acronym?